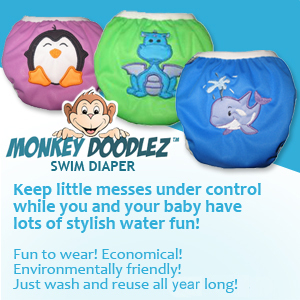 Our famous award winning Monkey Doodlez swimmer now has snaps! We've kept our signature fit, soft and durable fabrics, added some fantastic new appliques and added an easy and secure snap closure on the front of the diaper. Our swimmers will keep your baby in style and keep little messes under control while you and your baby have lots of water fun!